May 14, 2014 › Categories: Featured, Got Beer? 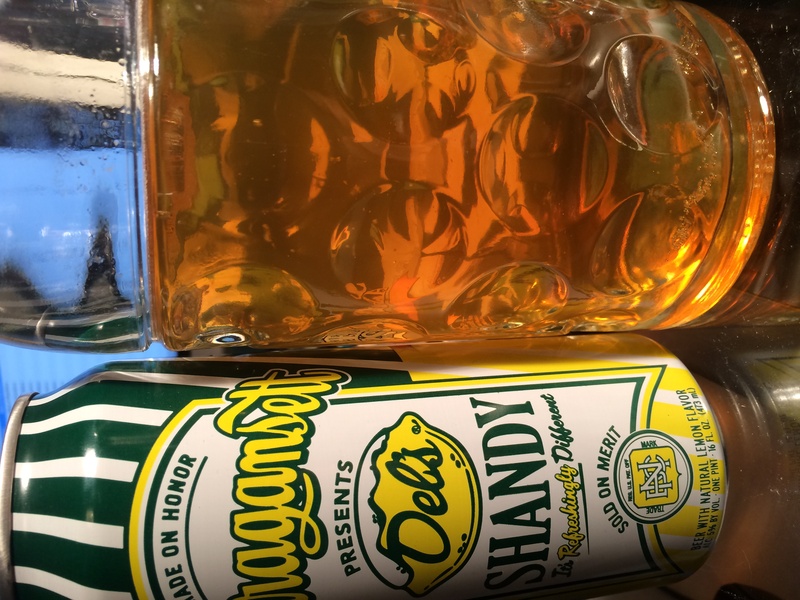 Unless you’ve been living under a rock or just thawed from a very large ice block, I’m sure you’ve heard of the Narragansett and Del’s collaboration on a shandy. For the uninitiated, shandy is the American version of what is known as Radler in Germany, or half lemonade and half beer. Beer purists stand down — if breweries such as Hofbrauhaus and Paulaner can find it acceptable to mix lemonade (or lemon soda) with their beer, then so can we. Reinheitsgebot (German purity law) be damned, we just like what tastes good! It’s been my experience that shandys will never measure up to Radlers since the beers and the ratios used in the USA usually don’t match up with the real McCoy. 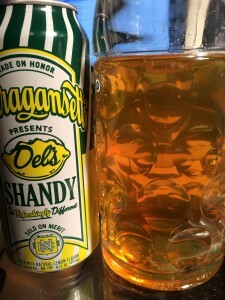 The Narragansett/Del’s Shandy was released to a rabidly salivating population on Monday, May 12 after word of its imminent arrival was leaked a few months earlier. Some stores, such as the Cranston Wines & More, known for their vast craft beer selection, sold out 25 cases in just a few hours. Other smaller stores such as IM Gan Discount Liquors still had stock as of Tuesday. And why shouldn’t they sell out on release day? What’s more Rhode Island than a Narragansett and Del’s collaboration, or a coffee cabinet and that place next to the old ALMACS that used to be on the corner? Was it a Hollywood Video? The beer itself resembles a hazy midday on Block Island with its bright, golden color without any direct source of sun. It greets your nose with a very familiar scent of those first few days of summer when anything is possible, otherwise known as Del’s Lemonade. Though, it plays its cards close to the chest and only lets a few hints of the supporting beer through on the aroma. The sip starts off with an assertive, sweet, crisp lemon flavor followed by a subtle bitterness, but only for those who are really paying attention. The overall product is not cloyingly sweet nor too fruity; it is a balanced blend of lager beer and lemonade. This beer would be perfect for a day at the beach, the deck at the Hot Club on a summer afternoon or a Saturday spent on the kickball field. On a personal note, this beer was very refreshing and the closest thing I’ve had to a Radler since I’ve been in Munich; I’ve had such a low opinion of shandys in general, I thought that even this collaboration was going to be a flop. Consider me pleasantly proven wrong; the Narragansett/Del’s Shandy is a solid beer with plenty to offer newcomers as well as beer snobs. The idea of a shandy may not have been ground-breaking, but the execution was spot on. This beer may not be a life changing beer, but it will certainly be an old summer favorite, ready to quench your thirst after mowing the lawn in the heat of the July sun or while waiting on the sidewalk for the veterans’ march in the Independence Day Parade in Bristol. Don’t worry, there’s no rush; summer beers like this are meant to be enjoyed slowly in good company and at the twilight of a summer’s day. It is because of this that Mark Hellendrung and Company (of Narragansett Beer) have decided to make this a summer-long brew, releasing batches continuously throughout the summer to ensure that there’s plenty for Rhode Islandahs to drink all summer long. So here’s to long summers and possibilities. Cheers! I've been able to get this locally here in MA. Good stuff. Previous post: Scene and Heard: The Future Is Now!